Lani Kai will be the name of Julie Reiner's upcoming SoHo bar. "It’s a beach in Kailua on Oahu," Reiner, a native Hawaiian, told me for an item recently posted in the New York Times' Diner's Journal. "It’s a beach I spent a lot of time at as a kid. It’s a beautiful spot. It’s means ‘heavenly waters.’ For me, the name refers to both the beauty of the island, which I’m trying to capture in this new space, but also to the liquid form itself, which I’m always about." The joint should be up and running in mid-August or September. I remain curious about the difference between a tiki bar and a Hawaiian-themed bar, as Reiner calls her new place. If you're counting, Lani Kai will be Reiner's fourth cocktail bar in the city, in which she's a partner or part-owner, after Pegu Club, Flatiron Lounge and Clover Club. 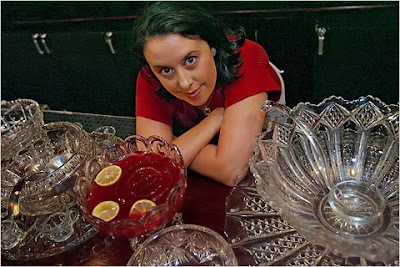 That puts her on par with the city's other most visible cocktail mugul, Sasha Petraske, who owns Milk & Honey, Little Branch, White Star and Dutch Kills. In other Reiner news, The Clover Club will begin weekday lunch service June 16.